Chris Hamilton, right, with father Bill and brother Scott. Like many of you reading this today, my father was my hero. I idolized him. If there was something to fix, I was right behind him with a toolbox. If he mentioned a camping trip or hike, I couldn’t get my bag packed fast enough. I was his shadow. As a man whose own father died when he was only four months old, my dad embraced fatherhood with everything he had. But he didn’t just teach me how to be a man. Whether he knew he was doing it or not, he taught me how to be a business man. You see, my dad was an entrepreneur. At the age of 35, with a wife and two young children at home, he decided to change careers and buy an insurance company in the small community of Orillia, Ont. It was an incredible gamble that changed the trajectory of my family’s life and led to a quarter-century of growth for his company. It also ended up being the first business lesson my dad ever taught me: You can’t win without taking risks. 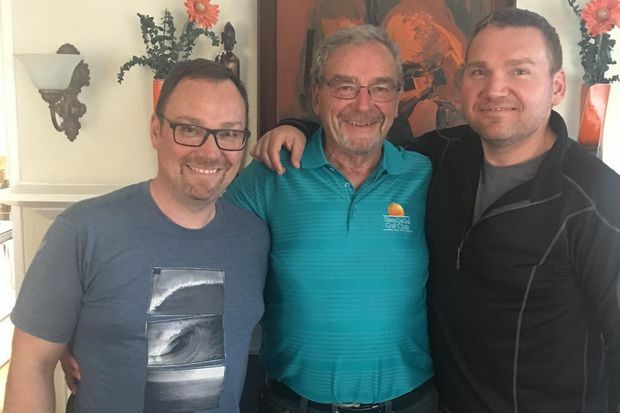 To celebrate Father’s Day and thank my dad for the impact he made on both my life and career, I’ve compiled five lessons on leadership that I learned from my father. I got my first taste of life as an entrepreneur when I was only 12. When the local BiWay store was going out of business, I swooped in and bought every last pair of athletic socks. Then I sold them door-to-door – one pair for $2, three pairs for $5. While I don’t exactly remember my profit margin, what always stuck with me is how my father never broke a sweat when I briefed him on my gym sock business plan. Dad took this same tack when I started a landscaping business at 16. He knew the most valuable lessons are those you learn through trial and error. It is a leadership philosophy that still guides me today. I feel like I am failing if I need to tell people what to do. Instead, I believe it is my job to help set the business’s course, make sure my team has the resources it needs, then get out of its way so the magic can happen. While employees need space to make their own decisions, it’s imperative that everyone on your team is guided by a core set of values. I remember my dad always had a strong sense of what was best for both parties. At Mars, we call this principle “mutuality.” Like any entrepreneur, he was fiercely competitive but it was never win at all costs. He wasn’t afraid to walk away from a deal if he didn’t feel it was right. While your business principles won’t align perfectly with my father’s, the important point is that you have values in place. As a leader, values provide you with a strong sense of purpose. They serve as a compass to guide business decisions and the decisions of your employees. And they will help you build stronger relationships with your customers, partners and colleagues. I promise you that. My father taught me a slight modification of “The Golden Rule.” He always said, “Treat others as they would want to be treated.” While this slight distinction no doubt helped my dad’s insurance business bring in repeat customers, I’ve employed his advice to get the most out of my associates. As a leader, I believe you need to listen to your employees to determine how each person measures success. Before making a decision that affects an individual’s career, I want to know how they want to be treated. What are their goals? What do they value? There’s always a fine balance between aspiration and capability, of course, but once you understand where a person is coming from, it becomes much easier to draw a path from where they are today to where they want to be tomorrow. By taking The Golden Rule one step further and really getting to know your employees, you can increase retention and boost performance across your organization. As any parent knows, you have very little say in what your children gravitate toward. When I was growing up, I liked swimming, something my dad knew almost nothing about. However, he quickly made it his mission to learn everything he could about the sport. Starting as a lane timer, he climbed the officiating ranks at Swimming Canada until he was inspecting turns and judging strokes for proper technique. It almost sounds crazy, but that’s my dad. He’s an inside-out learner, and I’m the same way. I remember when operations first started reporting to me. I would walk the floor, attend shift changeover meetings, observe the lines, etc. I wanted to understand what barriers existed on the shop floor, so I could get my associates the resources they needed to do their job. This is a lesson for all aspiring leaders. If you work at a large company, don’t be afraid to move into different business segments or take on assignments that may seem to be a stretch. At Mars, we encourage people to build an ambitious development plan because we believe leaders will make better decisions when they have a complete, well-rounded view of the business. At the lightning speed that business is evolving today, leaders need to be comfortable making bigger and bigger decisions with less and less info, faster and faster. You simply can’t afford to wait for the perfect product or ideal business conditions. You need to trust your experience and value set, so you can move quickly and correct your course as you go. Just as every father teaches their children to do their best, leaders need to let their employees know it’s okay to fail. Whether it’s encouraging employees to take on new assignments, put their hands up to offer different points of view, or make important decisions with limited information, you need to foster a culture of risk-taking within your organization, because as dad taught me: You can’t win without taking risks. AI ethics: How far should companies go to retain employees?